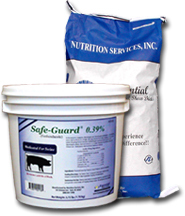 Safe-Guard 0.39% is medicated for swine for the removal of: Lungworms: Metastrongylus apri, Metastrongylus pudendotectus. Gastrointestinal worms: Adult and larvae (L3, L4 stages, liver, lung, intestinal forms) large roundworm (Ascaris suum); nodular (Oesophagostomum dentatum, Ornithostrongylus quadrispinulatum); small stomach (Hyostrongylus rubidus); Adult and larvae (L2, L3, L4 stages-intestinal mucosal forms) whipworm (Trichuris suis). Kindneyworm: Adult and larvae Stephanurus dentatus.